A plane carrying 127 people skidded and fell on its side on a runway at an airport in Bolivia after it appeared to collapse onto its landing gear. 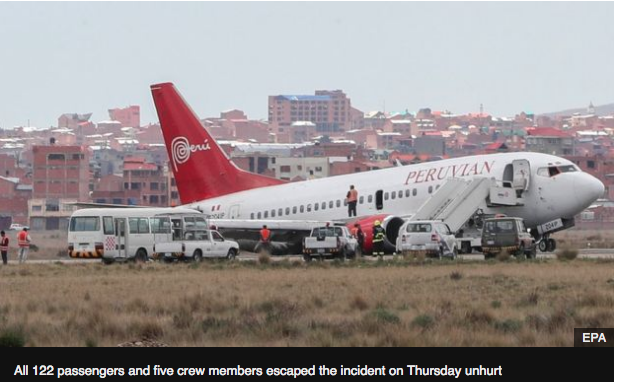 The Peruvian Airlines Boeing 737 was landing at El Alto airport, west of the capital La Paz, after arriving from Cuzco on Thursday. None of the 122 passengers or five crew members were hurt, officials said. The incident, which occurred at about 10:00 local time (14:00 GMT), forced the airport to close for several hours. Flights were suspended and a crane was brought in to help move the aircraft from the runway after its landing gear was crushed and its tyres burst. No issues were reported during the flight and the captain gave no warning as the plane approached the airport, passengers told local media. 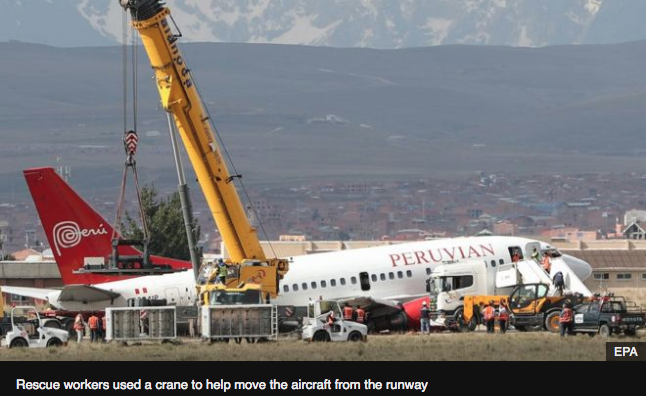 The cause of the accident is not yet known and is being investigated, Peruvian Airlines later said in a statement.